Normally, this would have been posted a week ago. Unfortunately, the MLB Draft signing deadline wasn’t until Friday, so I had to push this back a week. Here’s hoping it was worth it. In the past, I’ve done Top 15 and 25 midseason updates after publishing Top 30 an 50s, respectively, in the preseason. This year, I went with 30, because I’m sure folks didn’t really want me to rank 50 prospects for a midseason update (right?). Without further ado, here it is. Tell me how wrong I am (anyone but Jared, please). All players who have not reached 50 innings pitched, 130 at-bats in the Major Leagues and have less than 45 days of pre-Sept. 1 service time are eligible for this list. Numbers in parenthesis are the player’s rank in my preseason Top 100. – Seager is the best prospect remaining in the minors, according to Baseball America, Baseball Prospectus and ESPN. He’s a premium player and won’t be on these prospect lists much longer. If Jimmy Rollins weren’t a 16-year veteran of the game, Seager would have already been recalled. – He’s still just 18 years old and was dominating Double-A (11.5 K/9, 2.2 BB/9, 0.94 WHIP) before opting for elective cosmetic eye surgery. He has thrown one rehab game with the AZL Dodgers so far and should be back with Tulsa before too long and should debut in 2016. – The 30-year-old Cuban import began his season in Rancho and was sent to Tulsa and Oklahoma City. The only reason he’s in Arizona right now is because of a hamstring injury. Once he is healthy and gets a few more at-bats in the minors, he should be on the fast track to Los Angeles. – Last year’s 1st-round draft pick has been really good in Midland for the Loons, but he has struggled with his fastball command at times (4.9 BB/9). Other than that, he’s making strides with his breaking pitches and changeup. As long as he can harness his fastball, he should be a No. 2 or 3 starter. – De Leon dominated the California League before getting promoted to the Texas League. He hasn’t been as dominant, but he has still been pretty good. He has five double-digit strikeout games this season, but he’s been bitten by home runs (1.1 HR/9 at Tulsa) and walks (4.0 BB/9), so that’s something to keep an eye on going forward, but he is establishing himself as a Top 50 prospect in the minors. – The Dodgers’ highest-paid international player in the 2015-16 signing period (so far), Alvarez, 19, has electric stuff and he’ll probably be dominant in the Dominican Summer League. He probably won’t debut stateside until 2016, putting his ETA (for me) at 2018 at the earliest. – The team’s first draft pick in 2015, Buehler had a dominant performance at the College World Series in his penultimate game as a Commodore. He has some similarities to Tim Lincecum (especially the finish to his delivery), but he’s a little bigger than him, physically. He also reportedly needs Tommy John surgery, which puts a damper on his being draft at No. 24. – Barnes is putting up Russell Martin-esque numbers in OKC this year and even had a cup of coffee with the Dodgers when Yasmani Grandal suffered a concussion earlier in the season (and might be back soon for a similar reason). While he has played second- and third base in the past, he’s been solely a catcher in 2015. – Bellinger is one of the youngest players in the California League and skipped the Midwest League all together. He’s showing some really great power potential (24 doubles, 3 triples, 17 home runs), but it’s coming at a price (30.2 percent strikeout rate). Despite that, he’s making loud contact, plays great defense at first base and has played enough in center field to be an asset out there. Not many first basemen can say that. – Anderson has been good not great for Tulsa. His command and control are suffering (42 walks in 99 2/3 innings) and his strikeout rate has dipped more than 5 percent from last season. He might end up in the bullpen eventually, but he’ll remain a starter for now. – Cotton’s season started late due to a fractured wrist in spring training. He has shown no ill effects of that, as he has been flat-out dominant in 56 1/3 innings (2.56 ERA, 2.6 BB/9, 10.4 K/9). His profile says he’s a future reliever, but he has been nothing but successful as a starter for going on three seasons now. He could be one of the more attractive trade chips the Dodgers have before the deadline. – Lee is having a solid season with the OKC Dodgers, but a tingling in his throwing hand sidelined him for a few weeks. He’s back and actually was recalled on Saturday. However, he didn’t pitch as he was the 26th man in a doubleheader. He should get the call again sometime soon (unless the Dodgers trade for more starters and/or trade him). – The Midwest League had its way with Verdugo early on, but a hot June and July (.360 batting average) brought on by a change in his batting stance prompted good results. The power isn’t there yet and the plate discipline has tailed off, but he is good at barreling up the ball and making some loud contact. He’s also a solid center fielder. – Schebler also got off to a slow start, but he’s one of farm director Gabe Kapler‘s favorites, so it’s hard to drop him too much. He came up for one game in June and recorded his first MLB hit. He’s improved his walk rate a bit this season and could be included in a deal before the July 31 trade deadline. – Stripling is officially back from Tommy John surgery, as he’s already in Double-A and throwing with some similar velocity he had before the procedure. Once his off-speed stuff comes all the way back, he could be a contributor to the big league club. I wouldn’t expect that until next season, though. – He started off slowly at OKC and has picked it up of late. Still, his walk rate is down, his strikeout rate is up and he hasn’t been as effective on offense. Sweeney is using his speed better, as he’s already eclipsed his stolen base total from 2014 by 11. If his second base defense was at least average, he’d be much higher on this list. 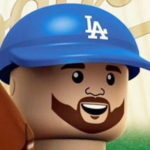 – “Pitbull,” as he’s known to some, was the second-most expensive international signing (so far) the Dodgers have made. He has a Yasiel Puig-esque physique and the ball absolutely jumps off his bat. He might end up in right field, but he’ll play some center field until that time. He has a chance to be an impact bat, if he continues to progress positively through the system. – Bird’s fastball is a legitimate mid-to-high-90s offering, but his off-speed stuff is still lacking behind. That might mean he ends up in the bullpen, but he’s going to stay in the rotation as long as possible. He has handled the California League relatively well for a 20-year-old (four home runs allowed in almost 80 innings), but his command needs improving (4.9 BB/9). – Medina is a big outfielder with some good power potential and feel for hitting. He has a lot of swing-and-miss in his game and not a ton of speed. He has dabbled in center field, but he looks like a profile right fielder at this point. He’s one of my favorite prospects in the system. – Barlow, 22, started the season off in Rancho pretty well, posting a 2.10 ERA in his first five starts. He owns a 2.43 ERA on the season and is striking out almost a batter an inning. His command needs a little work, but the stuff has come back. One bad thing: He has been on the disabled list since late-May after leaving his May 21 start with some shoulder soreness, so that’s somewhat concerning. – The Midwest League is a harsh mistress, and Leon can attest to that. He has yet to get it all going and was even sent back to extended spring training for a month. He has just 10 extra base hits and an ugly 11:69 walk-to-strikeout ratio. Fortunately, he’s young (19), plays a premium position and has plenty of time to turn things around. He’s probably made more progress defensively than offensively this season. – Rhame is a hard-throwing reliever who could be on the fast track to the majors. He’s in Double-A at age-22 and enjoying lots of success. Not sure if this is good or bad, but his walks per nine innings (3.5) is almost equal to his hits per nine innings (4.4) on the season. He also misses a lot of bats, as is evidenced by his 11.4 strikeouts per nine innings rate. – The Dodgers’ 2014 3rd-round pick, Richy has fared relatively well in the California League. He’s allowed just six home runs and issued 26 walks in 97 2/3 innings. I comped him to Stripling with less velo before the season. Perhaps the velo can tick up, but if not, he still has a chance to be a back-of-the-rotation starter. – De Jong, 21, was acquired for some international slot money from the Blue Jays. He was a 2nd-round pick in 2012 and has the look of a No. 4 or 5 starter, not dissimilar to Richy. He doesn’t have a lot of velo, but he has pitchability and is a guy to watch going forward. He’s jumping from the Midwest League to the Cal League, so don’t be surprised if his numbers don’t look the best. Also, don’t just scout the stat line. – Hansen was the Dodgers’ 2nd-round pick this year and signed an over-slot deal to forego his commitment to Stanford. It’s hard not to see a lot of Shawn Green in Hansen, as his swing is really nice and he has a lot of power potential. The beginning of his swing needs a little cleaning up, but he has quick hands and a nice, level swing that is conducive to lots of line drives. – The Dodgers signed Fernandez to an $8 million minor-league deal about the same time they signed Olivera, and the easy comp is Orlando Hernandez or Odrisamer Despaigne. He doesn’t have a lot of velo, but he throws the kitchen sink at hitters. He was a reliever in Cuba whose stuff profiles better in the rotation. He has a high-80s fastball that he can do all kinds of things with (sink, cut, run, etc. ), an assortment of breaking pitches and a changeup. At 25, he could move quickly through the system. – Ravin, 27, has a lot of velocity (97.5 MPH average in his first seven MLB innings) and a developing slider. He won’t ever be confused for Kenley Jansen when it comes to command/control, but Ravin needs to improve greatly in that department if he’s to have a long-term future in the majors. – Cash, 23, was a 2nd-rounder by the Dodgers in 2010 and didn’t work out as a starter. Since moving to the bullpen, he’s been much more effective. He still has command issues with his pitches, but his stuff is some of the best in the system. He’s somewhat similar to a guy like Chris Withrow and could be a guy to watch for MLB bullpen duty in 2016. – Paroubeck, 20, was the Padres’ 2nd-round pick in 2013. He was the first high school player now-Dodger scouting director Billy Gasparino drafted. He was acquired from the Braves (involved in Craig Kimbrel trade) for international slot money. He’s a toolsy, switch-hitting outfielder with a solid frame (6’2, 190 pounds), power potential and some speed. Making consistent contact might be an issue and could prevent him from reaching his ceiling. He’s still young, so there’s plenty of time for him to improve his game. He’s rehabbing from a quad injury that has kept him out the entire season (granted, he wasn’t ticketed for full-season ball anyway). He has also dealt with a shoulder injury in the past. He’s raw, but he has a lot of upside. – Brigham falls a bit despite having one of the best and heaviest fastballs in the system. He isn’t big at just 6’0, 200 pounds, but he gets his fastball into the mid-90s with a lot of sink and run. He has a 1.92 GO/AO this season and more strikeouts (74) than innings pitched (72). His off-speed stuff needs some work, as does his changeup. He might be a reliever long-term, but he’ll stay in the rotation likely all the way until Triple-A. Editor’s note: For those wondering, if the Dodgers had signed Eddy Julio Martinez (they’re still the favorites), I would have ranked him at No. 15. Kyle Funkhouser would have checked in at No. 9.